Update 2014-11-16: You should read my Twine Update if you are considering the purchase of a Twine. Twine is great. Out of the box, it’s easy to send email and SMS messages, but to really unleash this device’s potential, one needs to explore the HTTP Request action. This makes the Twine a node on the Internet of Things (IoT) and offers a lot of flexibility as to what can happen based on physical input. I’ve written about this before in my First Twine Project, in which I had a Twine and an Arduino talking through a quick and dirty “web service”. This was a fun proof of concept, but calling the PHP I wrote in 10 minutes a web service is a stretch. So, I’ve been looking for a more substantial web service that can be used by the Twine. Twine won’t work with many web services such as cosm (f.k.a. Pachube) or Open Sense, but it does work with at least one: ThingSpeak. ThingSpeak is quick to set up and offers a fair amount of flexibility. One can read & write data and integrate with other services such as a Twitter or Twilio. ThingSpeak also has the added bonus of being open source, so you can set it up on your own server, if you wish. 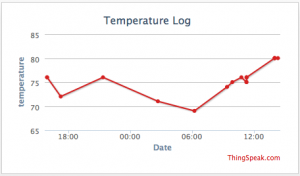 In my case, I just wanted to do some temperature logging. If you’re interested in how I did it, keep reading, the instructions are after the break. Recently, my Twine came in the mail. After getting it set up, I went to work on my first project. This is a goofy little demonstration project, but it shows some of the powerful capabilities of internet connected devices–the internet of things (IoT), if you will. The basic idea here is to make something happen when the orientation of the Twine is changed. I decided to raise and lower a flag. When the Twine is set up on end, the flag goes up, when it is placed flat, the flag goes down. This video shows the Twine and flag controller in action. Please excuse the poor overall quality of the video, and the build for that matter. Also, the very important message on the flag is just a bit out of date. Twine was one of those Kickstarter projects that really blew up. Supermechanical asked for $35K and ended up raising more than $550K. The project was funded at the beginning of 2012, so the funders have been waiting a while for their Twine. Mine arrived this week.